Eating out is dicey for diabetics. Be safe by avoiding rich sauces. Choose broiled and grilled dishes. Request dressings and sauces on the side for better control over what you eat. If the place has extra-large servings, share or pack a portion of it to carry home. Manage your medication accordingly to avoid low blood sugar. More questions and answers about living with diabetes here. 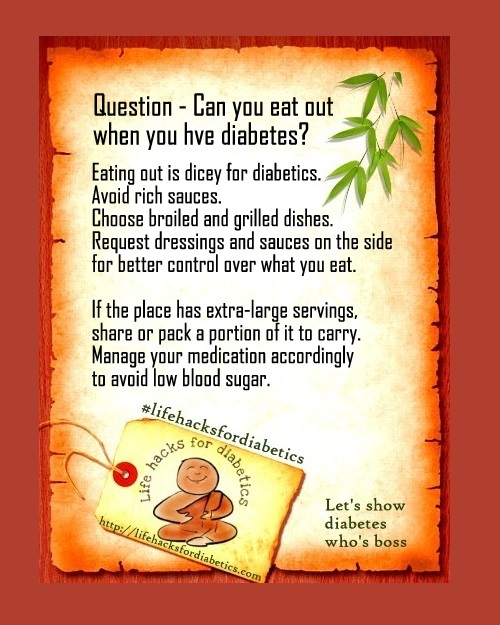 A to Z Challenge 2015 and Q is for Question – Can I eat out when I have diabetes?